Debora Hammond pulls a fresh batch of Cheese Bread from the oven. 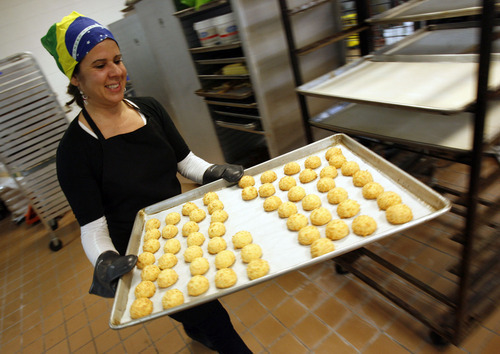 On Saturday, March 3, Cheese Bread Mania will introduce two new flavors of Brazilian cheese bread to customers. Owner Deborah Hammond is especially excited about the new Romeo and Juliet, which contains cojita cheese from Snowy Mountain Sheep's Creamery in Eden and guava jam made by Butcher's Bunches preserves in Logan. The new offerings will be available from 10 a.m. to about 2 p.m. at Caputo's Deli, 314 W. 300 South, Salt Lake City. Guava and cheese are a traditional dessert pairing in Brazil and other South American countries, Hammond said. And in the new bread, "the jam and cheese just melt into the dough creating a savory taste" one that pairs well with a glass of wine. Also on Saturday, Hammond also will introduce a classic Brazilian cheese bread made with just with Snowy Mountain's cojita cheese. These two new cheese breads are double the size of the usual offerings, about the size of a roll, said Hammond. A package of 8 sells for $7.99. If you can't make it to Caputo's this Saturday, Hammond will be selling the new flavors on Saturday, March 10 as well.